Every year, our most popular post. 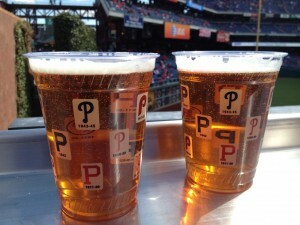 Check out our 2014 post and the latest CBP beer locations here. You’re a Philadelphia Phillies phan, and you like good beer. Your friend invites you to a game. Your seats are in Section 237 in left field, and all they’re pouring in that tiny corner up there are domestic brews. You know there’s good beer in the park, but you don’t feel like missing three innings of the game to search for your favorite local brew. Then again, just because you root for the Fightins to hit monster home runs off of the gigantic Budweiser sign in right field, doesn’t mean that you actually want to drink Budweiser. Have no fear, great brews are practically overflowing at Citizens Bank Park, and now you can find them with a little assistance from your good friends at Chocolate Covered Memories. Yes, indeed, we walked the entire ballpark, recorded what’s on draft, bottle and can in every location (well, we recorded the good stuff, that is) and created the ultimate brew locator for craft beer loving Phillies phans. Update (4/6/14): Well, it’s another year, and you know what that means … Time for another Phillies Citizens Bank Park beer locator to ease all your thirsty decisions at CBP. Check out our 2014 post and the latest CBP beer locations here. Get Thirsty! Enjoy! Cheers! And, of course, for a third straight year, again … Go Phils!